Hier kommen die neusten Angebote von unserem Sponsor Kapow Toys. Bonjour! quick update to let you good people know about some news products which are now in stock and an update on some stuff currently in transit. Stuff on the way in big planes! 1) Maketoys Giant Set C has begun to land and clear customs, these are shipped in boxes of 12 so we're getting them trickle through, we hope to have them all done by the end of this coming week. 2) GI JOE Retaliation - Wave 1 should land this week, this will pretty much be it until next Jan according to sources to grab them whilst you can. Main newsletter should be done and out this Sunday fingers crossed. Hier haben wir ein neues Review von unserem Sponsor Kapow Toys. 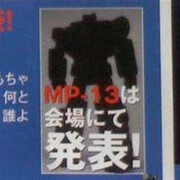 Dieses Mal wird TransFormers Prime Shadow Arma Micron Gora rezensiert. Microns are awesome, they were the saving grace of Armada and now Takara have put them with the already amaze balls Prime line. This little guy is normally Megatrons cohort but has been redone in see through black plastic for a Japanese store exclusive campaign. 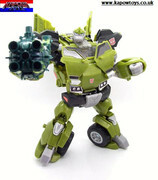 Transforming from what fans have come to call a Lugnut style robot mode, Gora forms a fusion cannon style weapon with 3 pegs molded into it for attachment to most Micron Arms figures, if your attaching him to Megatron you either need to use the peg hole for shoulder mounting, the flip down handle for hand held or the not great indent to mount it to his forearm. Another use for Gora and the best in my opinion is as a fusion cannon for the RID Voyager Megatron, as you can see from the images it is far more in proportion than his Poweriser weapon and looks a lot more like an actual weapon Megatron would use. Overall we score Gora 7/10 he's great if combined with an existing figure but just okay if bought and used on his own. 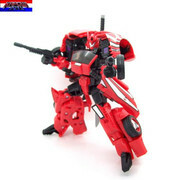 Hier kommt die Review zu Transformers Prime Cyberverse Ironhide von unserem Sponsor Kapow Toys. Viel Spaß! Alle Bilder und die Review sind unter Mehr! Ab jetzt kann man die kommenden Masterpiece Figuren bei unserem Sponsor Kapow Toys vorbestellen. Für NTF-Archive user kostet der Versand nur £8,50, egal wie viel und wie groß. Alle Bilder und die Reviews findet ihr unter Mehr! Unser neuer Sponsor Kapow Toys hat etwas Exklusives zur Vorbestellung bereit gestellt. Den Tokyo Toy Show 2012 First Edition Clear Optimus Prime kann man jetzt schon vorbestellen. Fragen werden gerne hier im Forum beantwortet.